The plan lays out a “national mobilization” to build “resiliency against climate change-related disasters” and “achieve 100% of the power demand in the United States through clean, renewable, and zero-emission energy sources”, Common Dreams notes. The Washington Post says the resolution has the support of nine senators and 60 members of the House of Representatives, including at least four candidates for the Democratic presidential nomination—Sens. Cory Booker (NJ), Kirsten Gillibrand (NY), Kamala Harris (CA), and Elizabeth Warren (MA)—who will all co-sponsor it. Independent Sen. Bernie Sanders (VT), who’s considering a repeat run for the nomination, also supports it. House Speaker Nancy Pelosi (CA) gave the plan “measured, careful praise”, Vox states: “Frankly, I haven’t seen it, but I do know it’s enthusiastic, and I welcome all the enthusiasm,” she told media. The plan “stipulates that any infrastructure deal struck with [Donald Trump] and other Republicans must address climate change, such as by building resilience to extreme weather events,” the Post adds. “It gives progressives something many of them have been itching for: The promise of a guaranteed high-paying job for every American,” backed in part by new trade rules designed to “stop the transfer of jobs and pollution overseas”. It also envisions investments in zero-emission vehicles, high-speed rail, and other public transit, aimed at remaking the country’s transportation sector “as much as is technologically possible”. 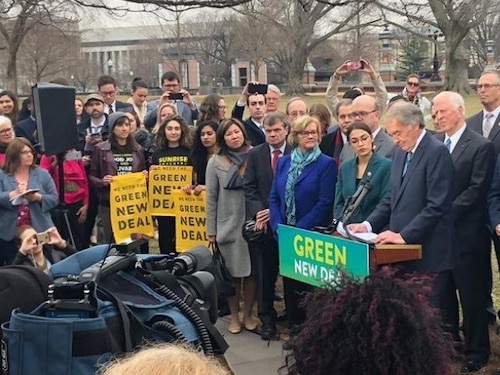 Several statements supporting the plan compared the scope of the Green New Deal to the way an earlier generation responded to what it saw as its own existential challenge. “This resolution outlines a plan to launch a WWII-scale transformation of our economy, including a just transition for workers and front-line communities,” the Sunrise Movement stated. “Senator Markey and Representative Ocasio-Cortez are telling the truth about what it will actually take to prevent climate catastrophe—a World War II-scale climate mobilization that eliminates greenhouse gas emissions in 10 years and draws down excess [greenhouse gases] from the atmosphere,” said Climate Mobilization Executive Director Margaret Klein Salamon. As expected, the resolution leaves out references to an outright ban on fossil fuels, nor does it explicitly exclude low-emitting electricity sources like nuclear and large hydro. Analysts cast those choices as a necessity to maintain the broad coalition behind the Green New Deal, but not everyone was entirely satisfied. Justice Democrats Executive Director Alexandra Rojas called the plan “an earthquake in the Democratic Party”, adding that “any Democrat running for president who wants to be taken seriously on climate and economic policy needs to back Ocasio-Cortez’s Green New Deal resolution”. This is what we need now.